My guest spot on Willie Jackson and John Tamihere’s show had to be extended by another hour to cope with the volume of calls. Not bad for the failed, tractionless nonentity that Willie trumpeted me as at the start! Thanks to Vinny Eastwood for the You Tubes. Why should we give Maori $30 million for ICT when they’ve got $37 billion of their own? Even though Maori have a $37 billion economy, Amy Adams and John Key are planning to give them another $30 million. The $30 million is compensation for the government quite rightly refusing to indulge the tribal fantasy that the recently discovered 4G radio spectrum is a sacred taonga. But of course, every refusal to indulge a Maori whim must be matched by a suitable — read sizeable — appeasement offering. In this case, a $30 million ICT fund exclusively for Maori. Adams said the fund would be ”recognition that the Government has a role to protect Maori language and culture as treaty partners”. The fund would also help the Government achieve its existing policy objectives of helping ”lift Maori participation and achievement”. ”I can see opportunities for initiatives improving digital literacy, potential scholarships to improve Maori ICT training, perhaps connectivity for marae, the development of ‘apps’ that supported Maori language content, innovation incubators…”. In fact, nothing in the Treaty calls for the government to protect Maori language and culture. It simply guaranteed them the property — the things — that they owned. 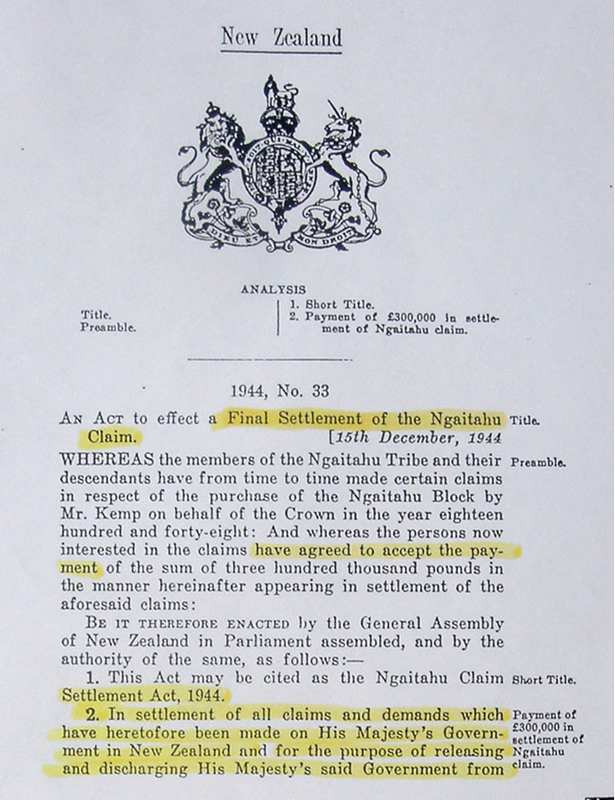 Taonga in the dictionary of 1820 meant ‘property procured by the spear’. In the 1844 dictionary: ‘property’. Nothing about language or culture. Nothing about ICT. And nothing about 4G. And you won’t find anything in the Treaty about the Crown and Maori being ‘partners’. The Treaty was a sovereignty for protection deal, that was all. If Maori want to improve their computer skills, let them do it. What a shame the Ironman New Zealand organisers lack the mettle of their competitors. What a shame they agreed to bribe the tribe. “We refuse to pay you so much as a bent cent to swim in our largest lake. “And it is our lake. Not your lake. It belongs to us. All of us. “All the people of New Zealand. “How very conveniently you use the modern meaning of that word, and not the 1840 meaning. “And yet surely, if you’re talking Treaty rights, it would be only fair to use the meaning current at the time of the Treaty? “Of course, we know your tribe did not sign the Treaty. “But they were happy, were they not, to accept all the wonderful benefits of modern civilisation that flowed from it? “Just as their descendants are happy to use it to screw money from their fellow citizens. 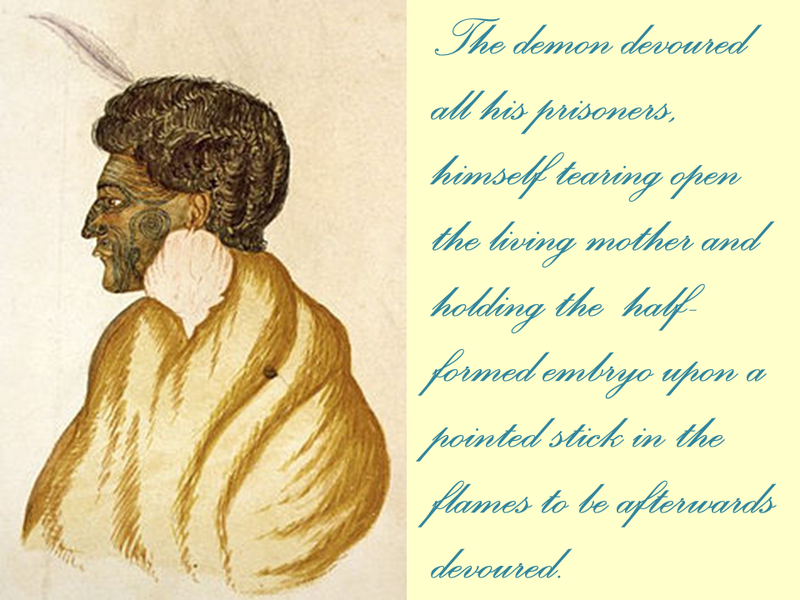 “But back to the meaning of taonga, circa 1840. You see, we looked it up. And what did we find? 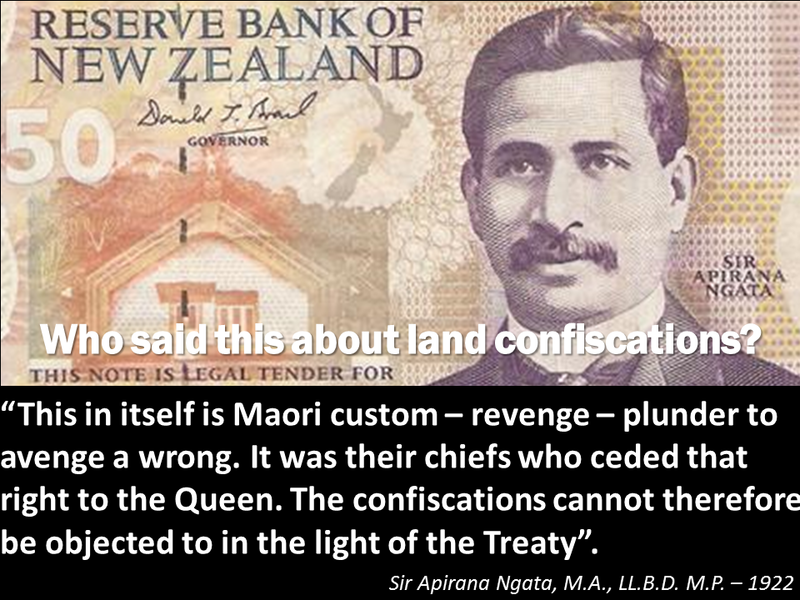 “In the only dictionary current at the time of Te Tiriti, taonga was defined as ‘property procured by the spear’. “And the man who defined it for Cambridge University was none other than the great Ngapuhi warrior chief Hongi Hika, in England looking for guns. “You want a second opinion? Then let’s take the next dictionary, published in 1844 — four years after the Treaty. “Same thing: taonga: ‘property’. Nothing about treasure. Or wind. Or radio waves. “Taonga to your part-ancestors was their stuff. It was their chattels. The cloaks they dressed in. The hooks they fished with. 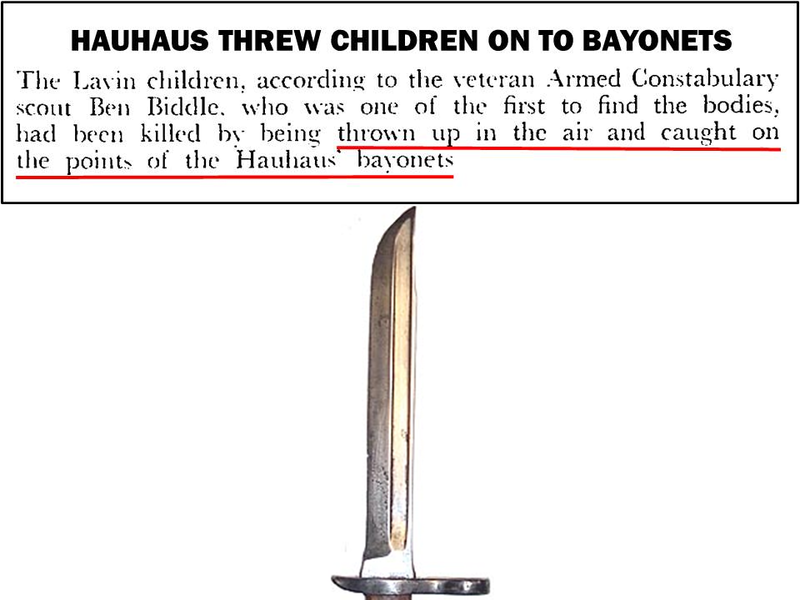 The tomahawks they butchered their slaves with. “It most certainly was not their whole ecosystem. It was not their language. It was not everything their great-grandchildren would one day take a shine to. “You cannot spear a lake. “So if you want us to bribe you to swim in that lake, you’re out of luck. “On behalf of all decent New Zealanders, who, unlike you, have a highly developed sense of fair play, we will cancel this event for good rather than submit to your bribery and corruption. 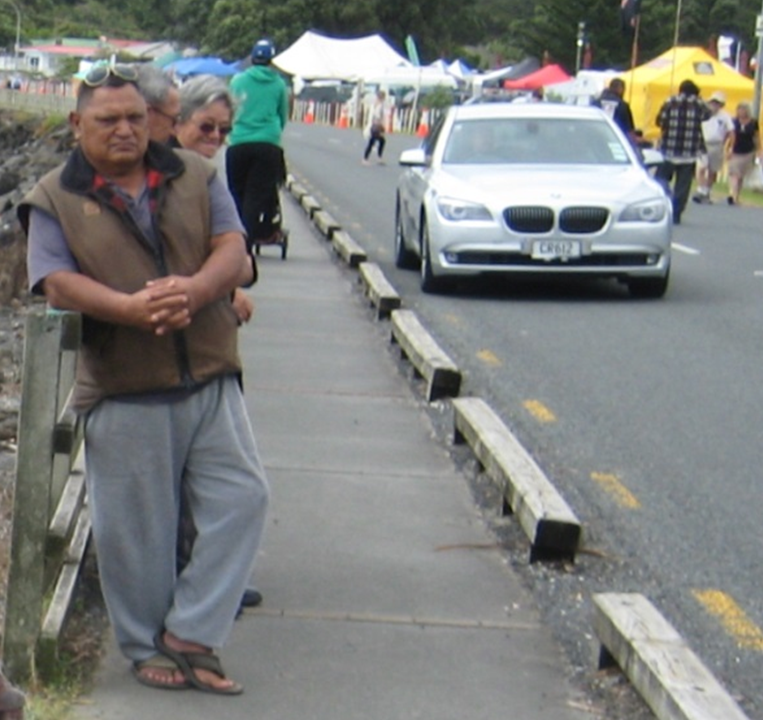 “When the mayor and citizens of Taupo deservedly condemn you for your greed, do not blame anyone but yourselves. “Let your greed be on your conscience, if you have one. “Unlike you, we do not believe New Zealanders should have to pay a licence fee for the use of their country. “Taupo mayor Rick Cooper says your moneygrubbing makes him feel sick. Have you had your email from John Bond/Tony Montana/Tropicana yet? As I’ve long suspected, the now banned commenter Tropicana is John C of Whangarei AKA John Bond AKA Tony Montana. This serial ejectee, who just yesterday denied using multiple identities on this blog, is now pumping out emails as John Bond (an old alias of John C’s) claiming, among other things, that I use multiple identities. He also claims that the Fraud Squad is investigating me for running a scam to extort money from bewildered old blog readers when I have apparently no intention of ever running a Treatygate campaign. What seems to have escaped this escapee from the Australia foreign service is that I’ve actually been running the campaign for some time. 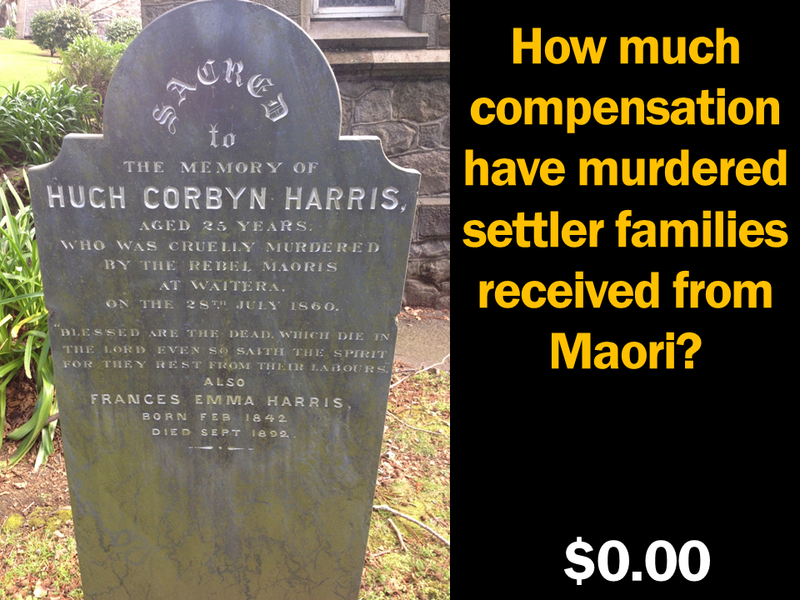 Every time I post some evidence here, I’m working on the campaign to inform New Zealanders about Treatygate. It must be getting some traction or Willie Jackson and John Tamihere wouldn’t have had me on their show on Wednesday– or asked me to stay for another hour because the phones were running so hot. 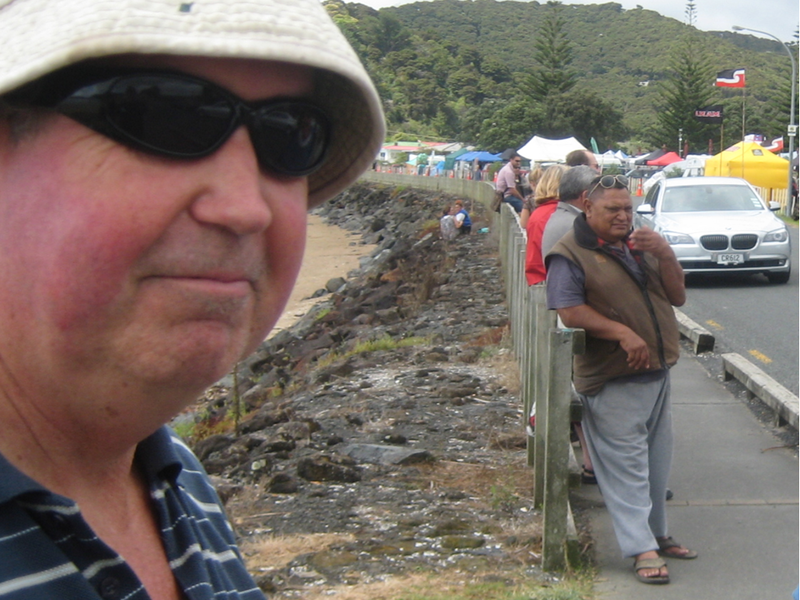 If I’m not campaigning, John, what was I doing banner-waving with Mike Butler at Waitangi — at some personal cost? Or banner-waving on Prime News from the steps of Parliament? 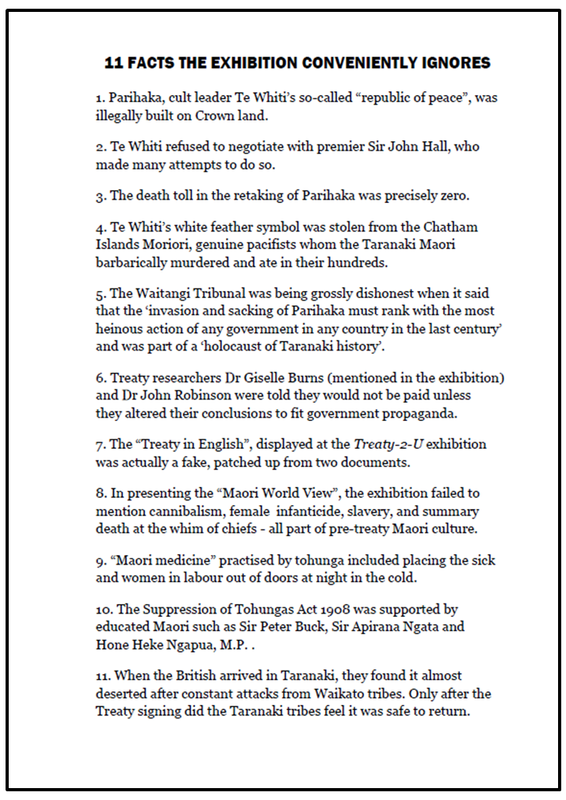 Or handing out leaflets and heckling at the Te Papa Treaty ‘Debates’? Or presenting my 200 carefully-prepared slides of evidence to meetings in Nelson and Auckland and Tauranga and Kapiti and Wellington? And why would someone who is so open/naïve/stupid (take your pick) as to give a week’s notice of his intention to visit the hotbed of Griever Maori protest on the day when he would be most outnumbered, feel the need to cower behind a slew of alter egos? Some say I should ignore this highly plausible but dangerously disturbed man — that talking about him will just give him the attention he so clearly craves. But I’ve always preferred to answer my critics upfront — especially those who bag me behind my back. If you get an email from John Bond, I trust the above will give you an idea of what to do with it. And John, if you threaten me the way you did the last time you got banned, my next call will be to the Whangarei police. I’m just about to go to Radio Live, so for the benefit of Radio Live listeners I’ve put up a few of the 210 slides I show in my talks. I don’t have time to add the commentary till later, but hopefully you’ll see enough evidence to realise that Treatygate is disturbingly real. 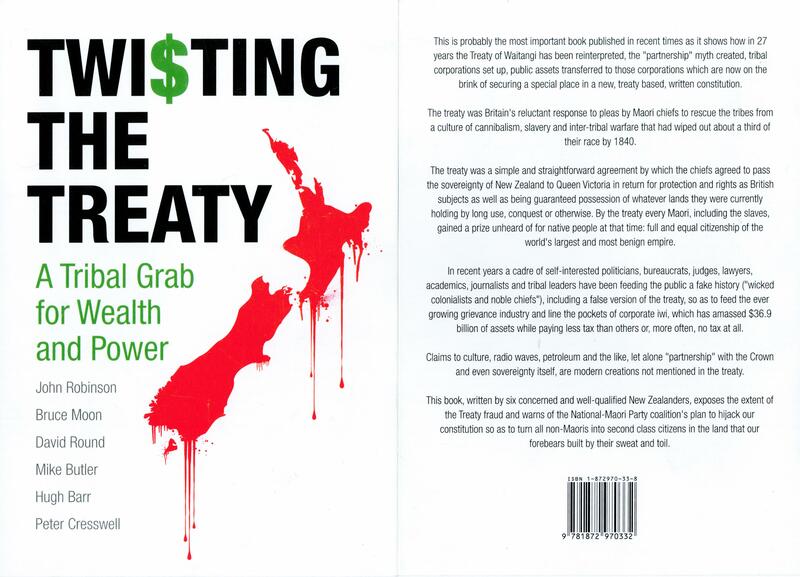 Just printed and not yet in the shops: 414 pages of Treatygate dynamite by six of New Zealand’s best Treaty truth-tellers. Twisting the Treaty — A Tribal Grab for Wealth and Power will tell you all you need to know about the history-twisting of the last forty years, and who’s been conning you. Click on the above image and read the back cover for a full summary. The Appendix includes a full list of all assets passed over to tribes under the Waitangi Tribunal process. Secure your advance copy now by emailing books@treatygate.org.nz. Just write Twisting the Treaty in the subject line and your address details in the body, and the publisher will get back to you ASAP. 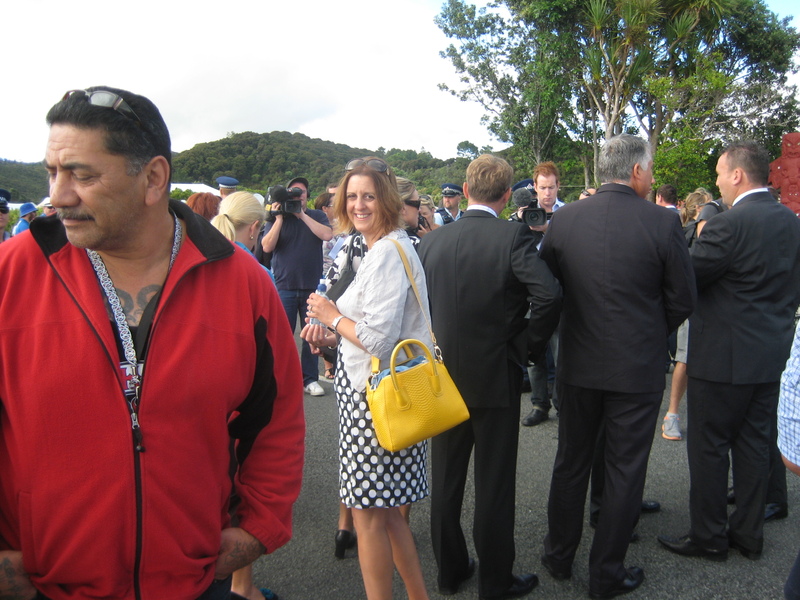 Marae bully standing between us and Crown car. When I announced that I was going to Waitangi, I was warned that radical Maori would try to defeat me with “manipulation, intimidation and control”. I’ve certainly experienced the manipulation (or as I call it: lying) when dealing with their TV reporters. Invariably they promise one thing and do another, or completely twist what I’ve said. Control is what the media have when slanting a story their way. 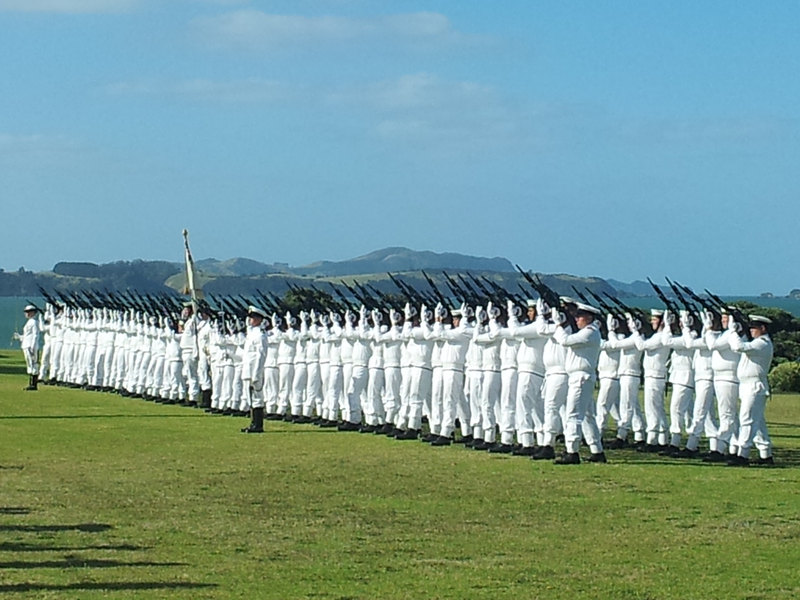 But Waitangi 2013 was my first experience of in-your-face intimidation. Above was the face that got in my face — twice. Everywhere flags and posters proclaim that this is Harawira Country, where men are bullies, women are too, and prime ministers and racial equalists should be nervous. But I don’t want to give you the wrong impression. From what I could see, the physical Harawira influence was minimal with the absence of the Popata brothers (who last year led a march on the flag pole to tear down the New Zealand flag and replace it with the Maori sovereignty flag). 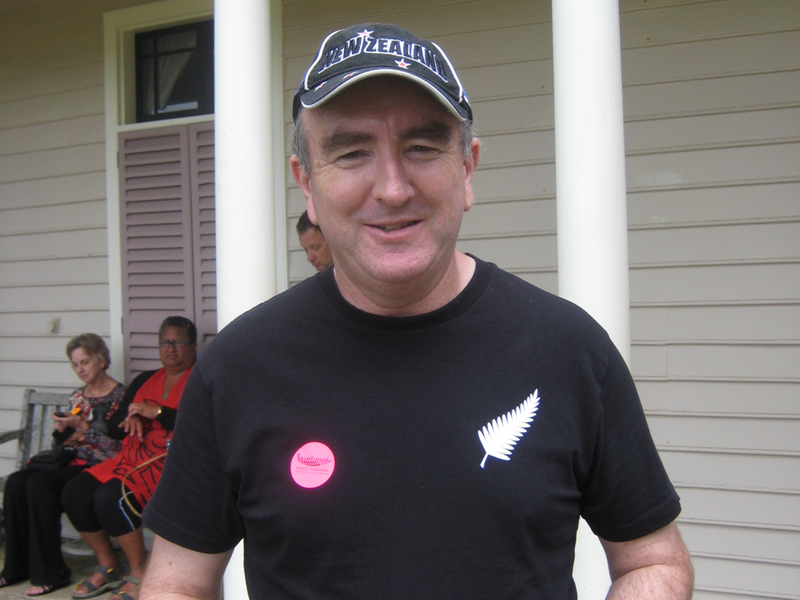 Actually, by far the majority of the people we met at Waitangi — Maori and non — were warm, friendly and hospitable. It’s clearly only a small minority who cause the trouble. Note the Israeli flag there. I thought the Palestinians would have been more popular among Hone’s mob than the Red Sea Pedestrians. The Lower (Te Tii) Marae. See the red-roofed shelter at right? 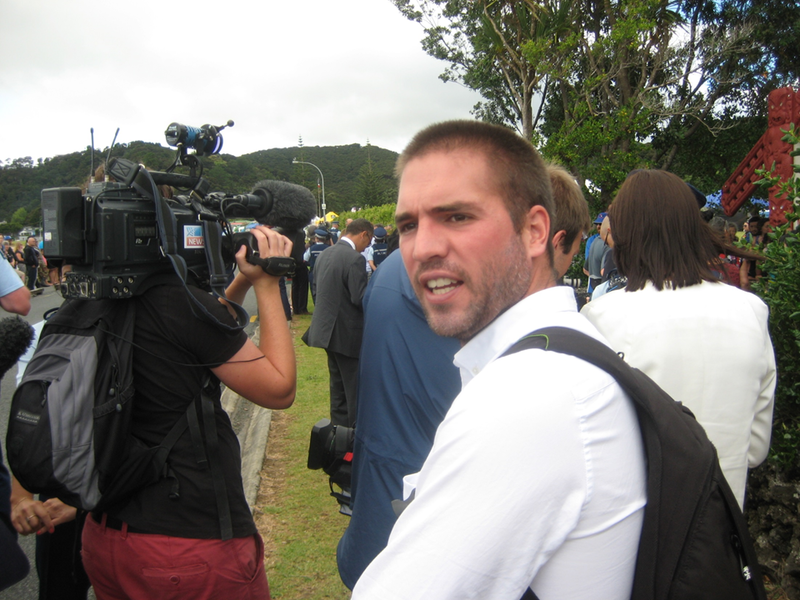 That’s where Simon Day from Fairfax (above) thought he could interview me without us being molested. “In here’ll be fine,” says Simon, pointing to the marae gate. To me, it didn’t feel that respectful, given what the members were likely to overhear me saying about matters they held dear. But Simon and his photographer were insistent. 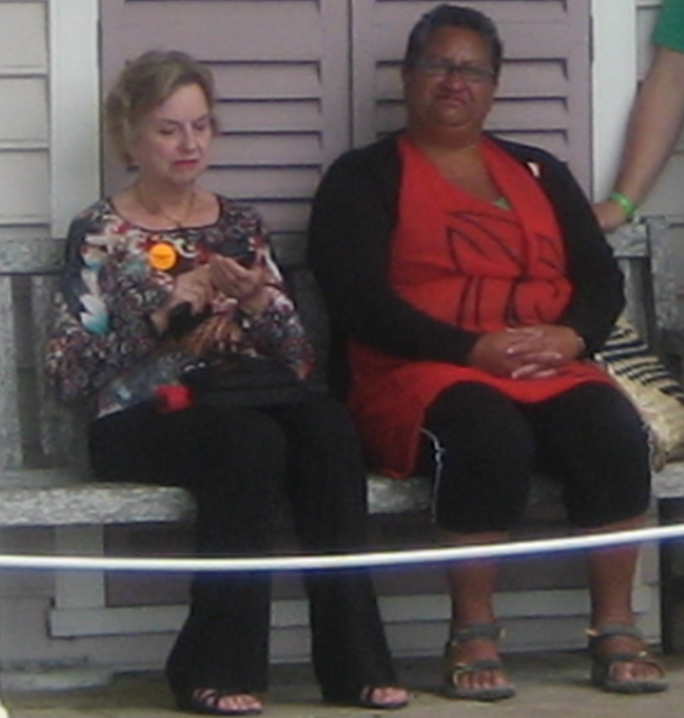 And so we conducted our interview on a bench inside Te Tii Marae. After a few minutes, a large and very angry man sitting nearby decided he’d heard enough. Of the words he said to me, only the word ‘racist’ is printable. I got the hint. Even Simon got the hint. We continued the interview outside. His story appeared later that day. Simon’s photographer took some shots of me looking proud and defiant in my silver fern shirt, with a view to using them in a Sunday Star-Times feature. Somehow the planned longer interview didn’t quite happen. 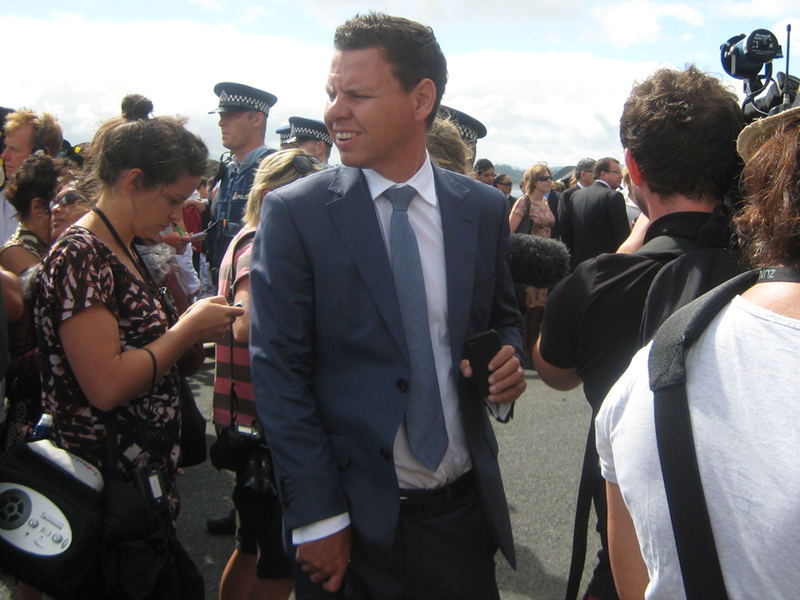 One News’s Patrick Gower and throng waiting for Queen Harawira to win the Battle of the Hands. John Key was kept waiting forty minutes while Hell’s Granny bullied her way into the prime prime ministerial hand-holding position — and of course, so was everyone else. Why we indulge this former violent jailbird and her violent family, I’ll never know. The Nats were out in force. Not all my old friends from the good old days were this happy to see me. Welfare minister Paula Bennett, a person I don’t know, and prolific author/MP Paul Goldsmith. There was much fawning over Finlayson, but I couldn’t get close enough to his entourage to capture it. Former National Party HQ accountant-turned-MP Katrina Shanks. Minister of Edu-chaos Hekia Parata (in bright blue) banters with some school students. Mike Butler trying to look inconspicuous, with a Treatygate banner disguised as a roll of wallpaper. He’d wisely advised me to leave the other banner — attached to long, fat conspicuous pipes — in the car. Loitering with intent to unfurl banner when Key arrives. We knew if we did it sooner, we’d get it confiscated (legally or illegally). 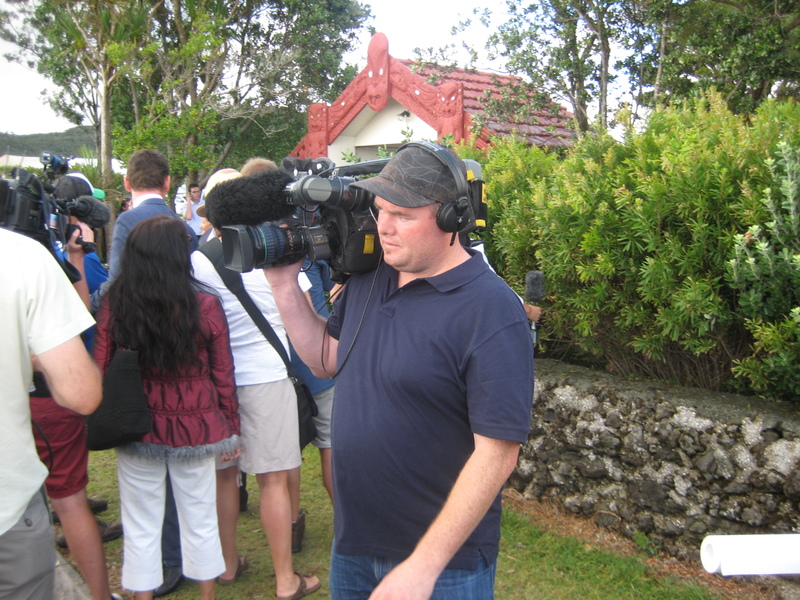 Being studiously ignored by One News cameraman. 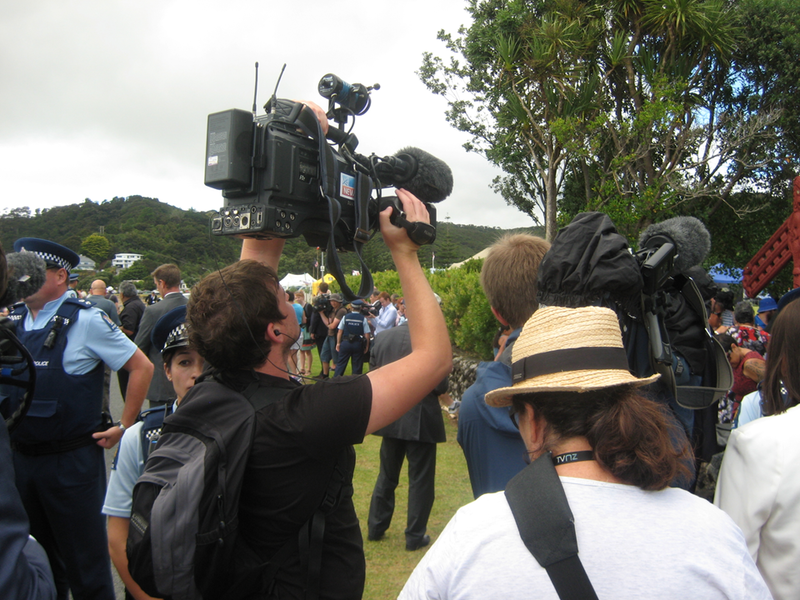 Being studiously ignored by 3 News cameraman. 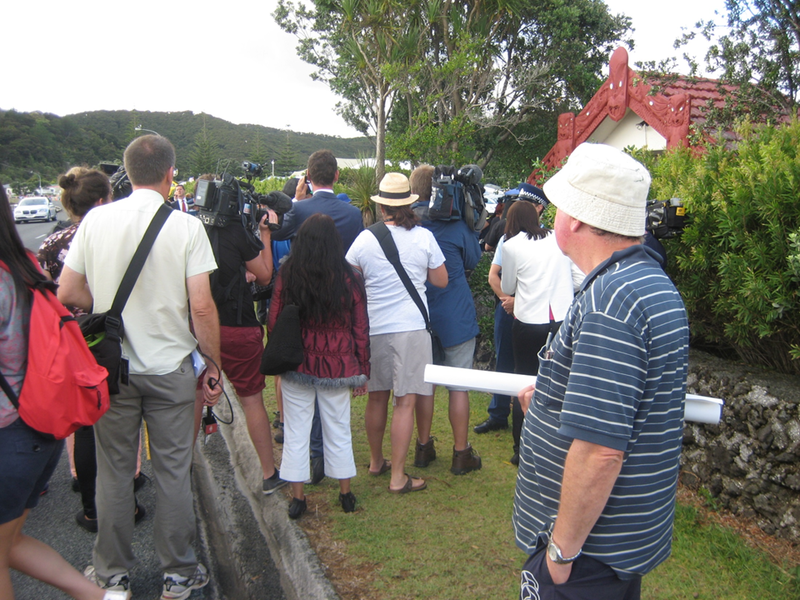 When Key finally arrived at the lower marae, Mike and I had installed ourselves immediately behind the One News and 3 News crews and Simon Day from Fairfax, and as close as we could get to the police line. As Key got out, we raised the Treatygate banner above our heads. He looked over. The news crews didn’t. He went through the gate. So did they. 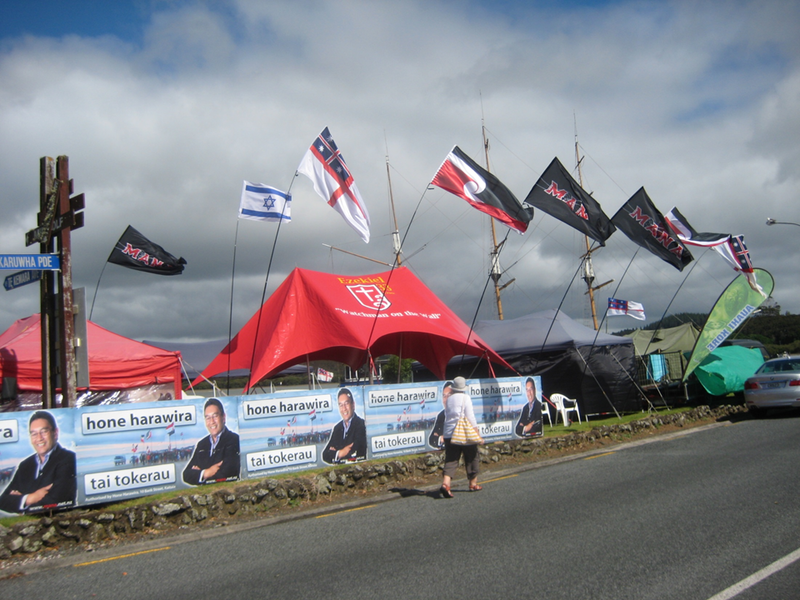 To our surprise, ours was the only protest of any kind at Waitangi this year. But the media didn’t want to know. We were too busy doing it to film it. They were clearly under instructions to ignore it. 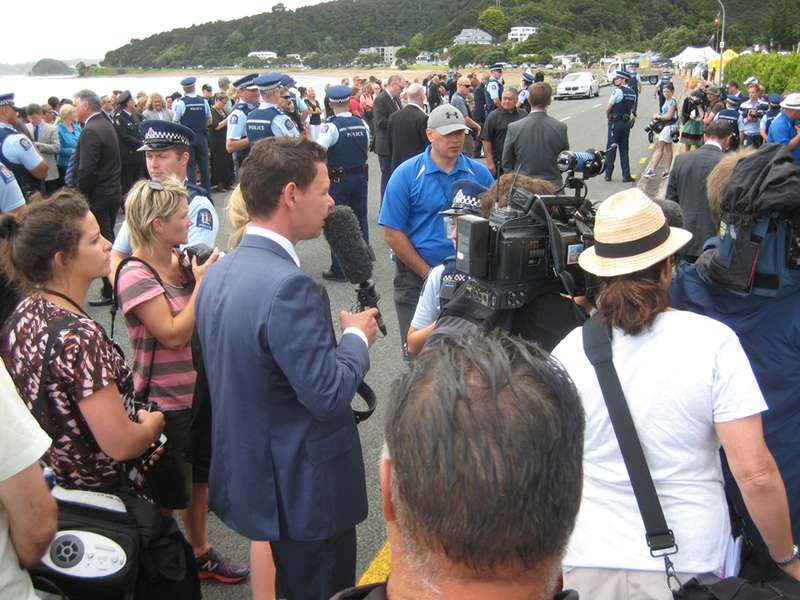 Being studiously ignored by Patrick Gower. Being studiously monitored by marae thug. 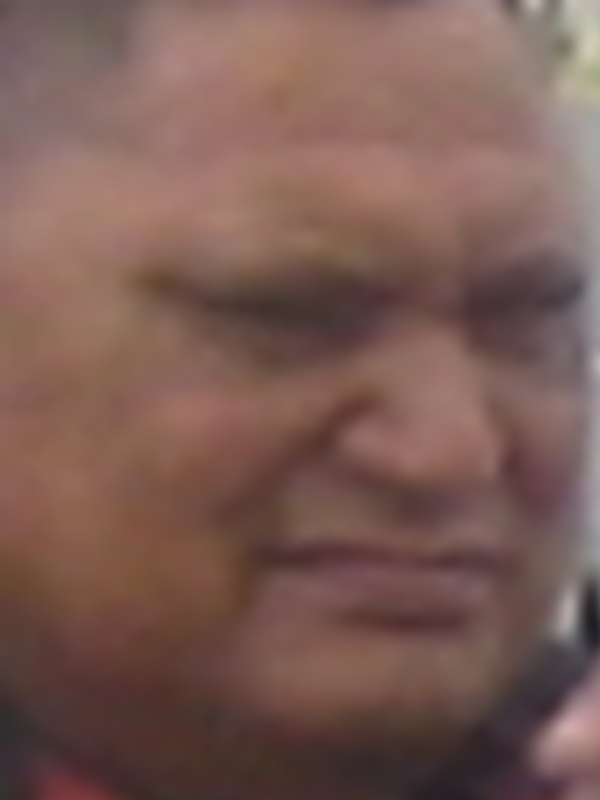 Ever since evicting me from the marae, he was watching my every move. Being studiously smirked at by Mike Butler, who knows it’s not really him I’m snapping. 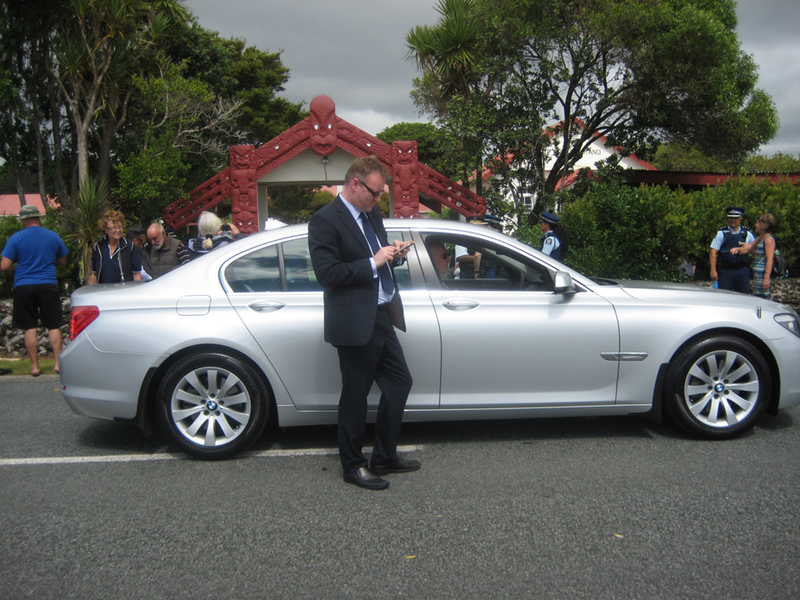 The PM’s Press Chief Kevin Taylor waiting beside the PM’s Beamer while the PM is entertained by Titewhai and friends. 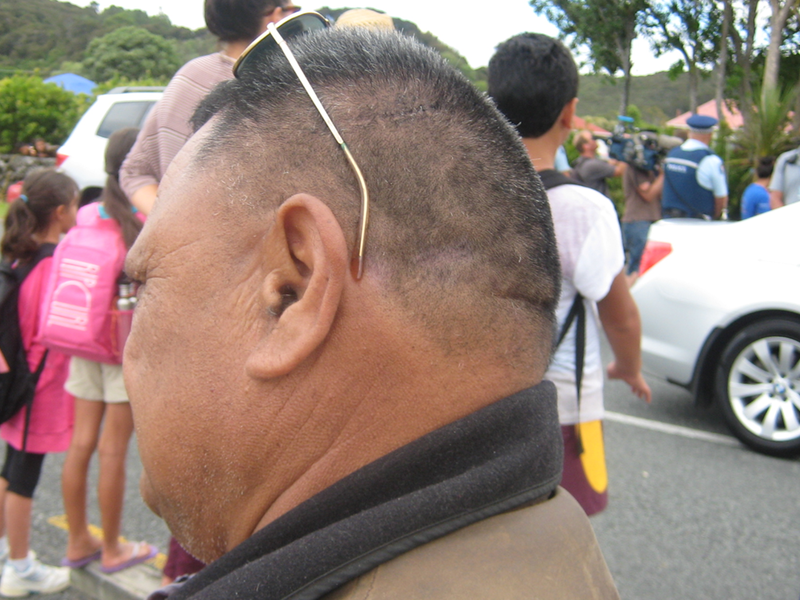 I’d forgotten to apply sunscreen, so by the time our 2-3 hour wait for Key to emerge from the marae was over, I really was a redneck. A large and not-so-red neck. 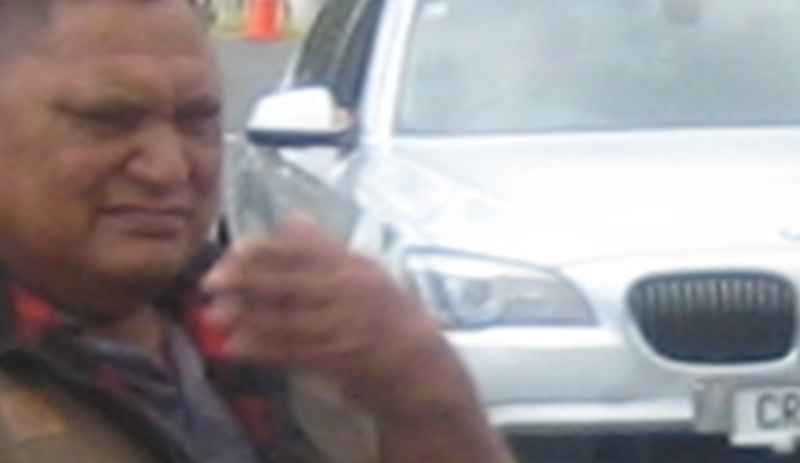 The marae bully, just before he turned and tore at our banner like a frenzied mako. Mike and I differed on how to respond. We tussled with the bully for a while. But as a landlord, Mike was triggered by memories of close encounters with similar-looking characters. He knew the guy’s violence would only escalate into a major assault. I, meanwhile, thought this was just what we needed if we were to get news coverage. Once the thug had prevented the Treatygate banner from being seen by the cameras as Key exited the marae, he wandered away, mission accomplished. Next year, we’ll need reinforcements. 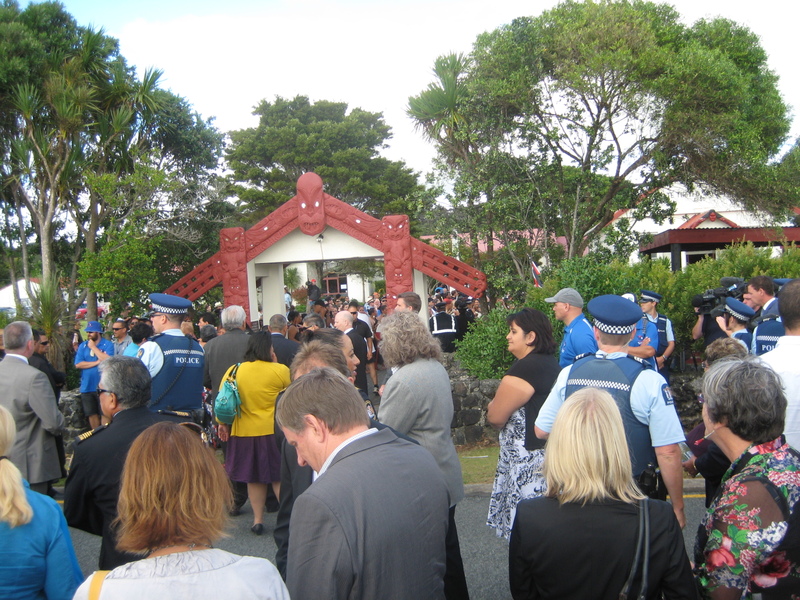 Two or three hours after he went in, Key emerges from Te Tii Marae. I introduced myself to Willie Jackson. Mike asks him a curly one. 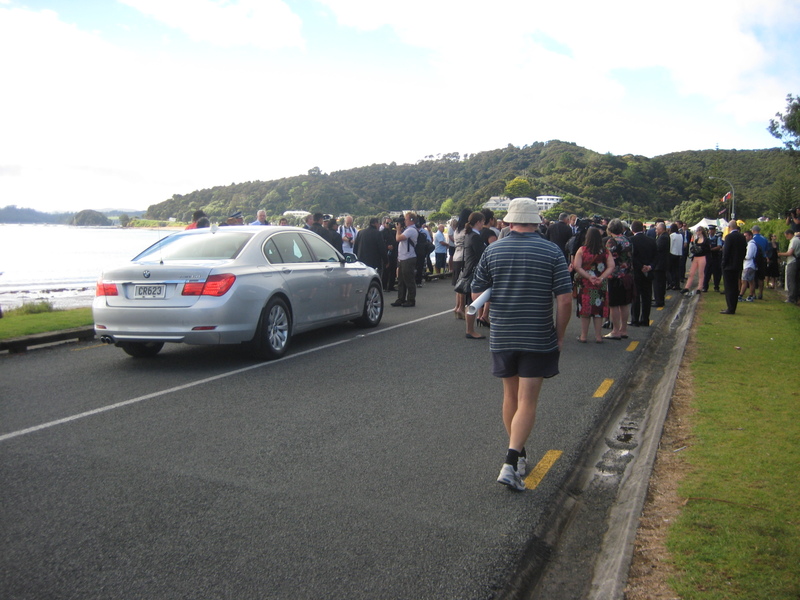 Behind is the SUV of John Tamihere, who turns up briefly, but has to dash off before Willie can properly introduce us. Jackson’s attitude is basically, “You’re racists, but no hard feelings.” He speaks surprisingly highly of Don Brash as a gentleman. I think Willie is the most outspoken racist in New Zealand. He says he can’t be because he’s not in a position of power. I don’t know what he calls that radio show! See that lady behind me on the porch — the one on the left — doesn’t she look familiar? Why yes, it’s our old Te Papa Treaty ‘Debate’ organiser, Dame Claudia Orange — with appropriate orange badge — and appropriate friend. A naval firing squad missing Dame Claudia by miles. 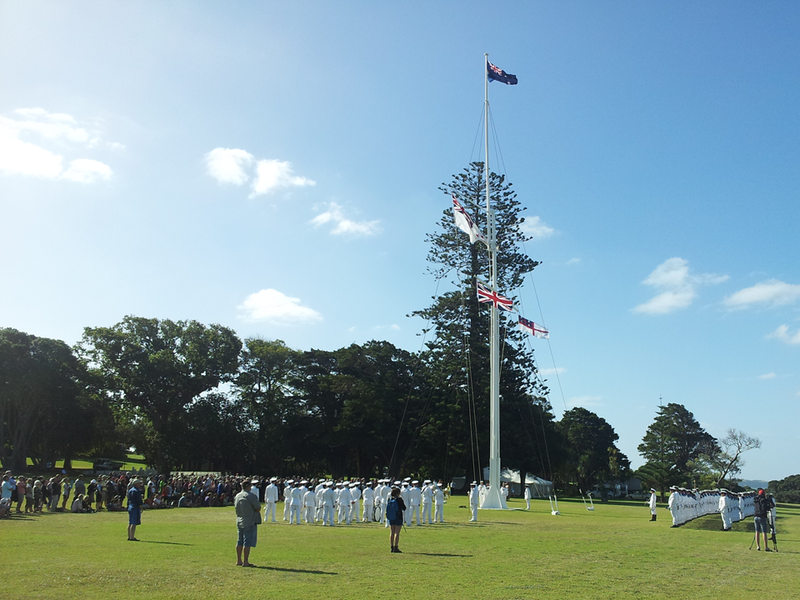 A flag ceremony. I think it may have been called Beating the Retreat — which would have been apt. 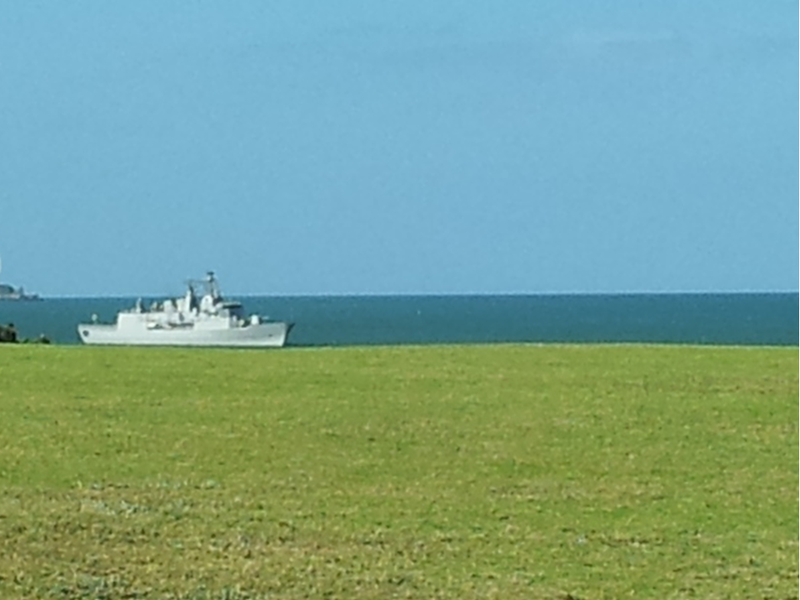 A naval frigate runs aground on the Treaty House lawn. Not far from here, Mike videoed me making my speech, as well as an impromptu narrated sweep of the Bay to show where the Treaty was drafted, translated and signed. 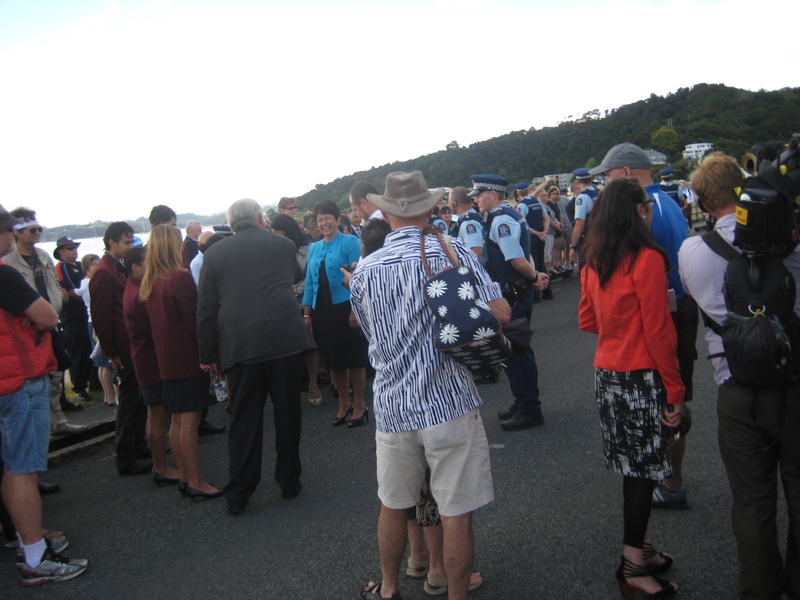 It was my first experience of the Waitangi commemoration. I’m pleased I went. I’d expected more trouble, and hoped for more media interest. Thanks to Mike Butler for immediately putting up his hand to accompany me, and for paying for our motel. Thanks to Vinny Eastwood for lending me his camera. Thanks to the wonderful couple who put me up in Auckland on the way there and back. And thanks to all of you who will, I hope, volunteer to come with me next year! 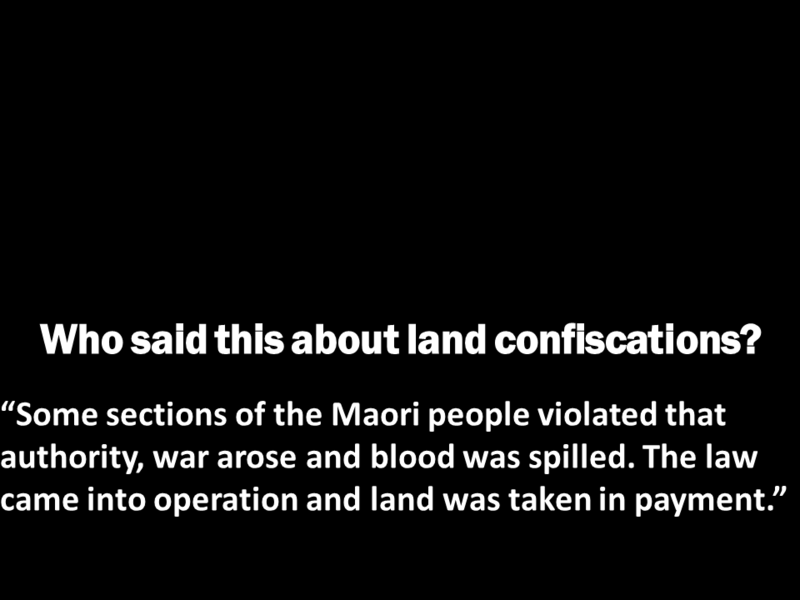 You may remember my Marae Investigates appearance with Peter Meihana on the subject of Maori privilege. I remember it mainly for the tart parting shot of TVNZ anchorperson Miriama Kamo. I’d just pointed out — with the help of a wide scroll festooned with privileges — that for at least 20 years we’ve been paying the equivalent of a South Canterbury Finance bailout every year to Maori — $1.5 billion — simply for being Maori. 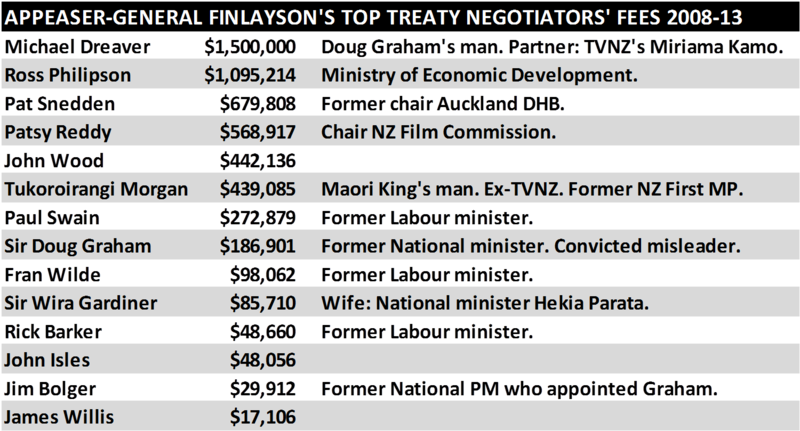 Now, thanks to Winston Peters and the Sunday Star-Times, we find that Kamo’s partner is far and away the biggest earner in the business of negotiating the surrender of New Zealand assets to Maori. Since National came to power in late 2008, Michael Dreaver’s company The Policy Shop has earned $1.5 million from negotiating away your money to more than 20 iwi in the Auckland and Hauraki area. 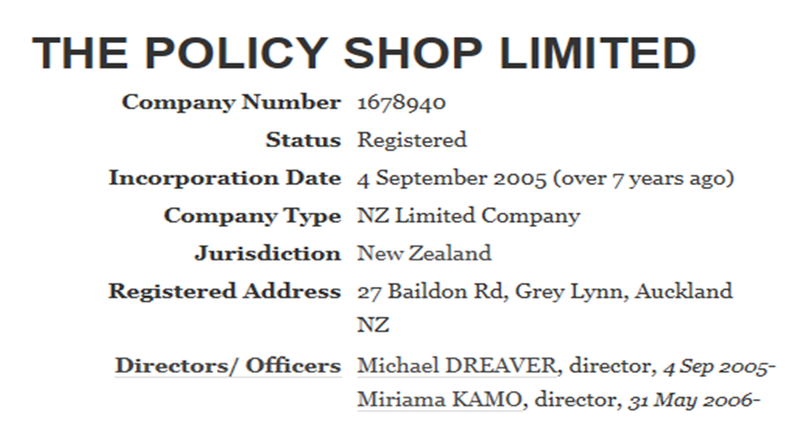 Except that The Policy Shop is not just Michael Dreaver’s company. Michael Dreaver and Miriama Kamo: riding First Class on the Treaty Gravy Train. So Miriama Kamo is making a tidy sum helping Chris Finlayson dispense Maori privilege. She herself probably owes her job to Maori privilege, given her uneven facial feature, which I suspect would disqualify any non-Maori broadcaster from the role of television newsreader. 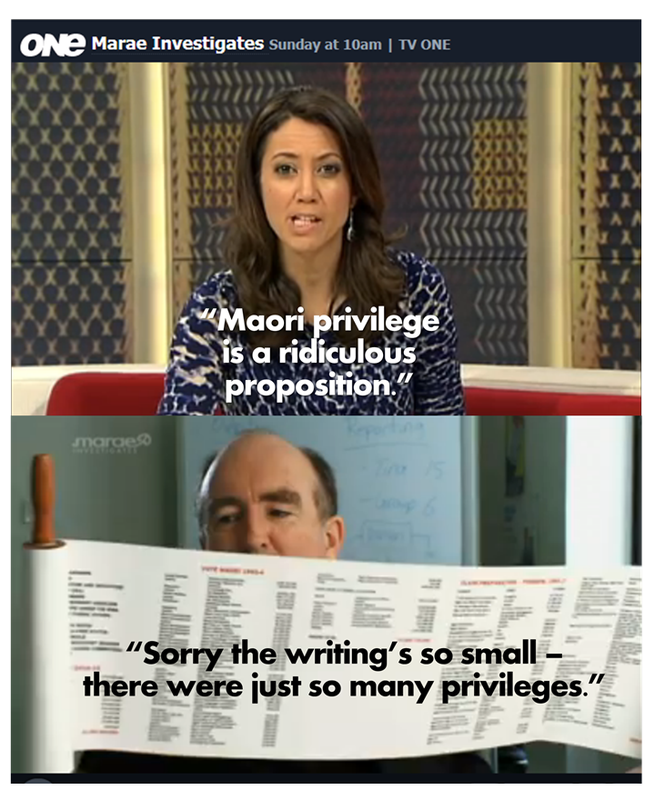 So for Kamo to deny the existence of Maori privilege after all that is breathtaking. Dreaver and Kamo, it seems, are go-betweens, not just for Appeaser-General Chris Finlayson, but also for Sir Douglas Graham. Graham was the National justice minister who surrendered $170 million worth of your assets to Ngai Tahu. Not content with ripping off the shareholders of New Zealand Inc., Graham, seen here in the dock, was also convicted of misleading shareholders in Lombard Finance, at a cost to the country of another $111 million. Graham has himself earned $186, 901 doing Treaty deals for his successor — a minister who measures his success by how much of his country he can surrender in how little time. Finlayson told the Star-Times the negotiators’ results spoke for themselves. In Tamaki Makaurau, for example, there had been no settlements at all when Dreaver was appointed in 2008 and there were now seven agreements in principle and a signed deed of settlement with 12 groups around Auckland’s volcanic cones. He described the 14 negotiators as “one of the top teams assembled in Government”. In that chamber of Chamberlains that passes for our Parliament, he may well be right. Sorry if subscribers are getting emails relating to old posts. It’s just that I’ve noticed that quite a few relevant old posts did not get transferred from my old blog to this one, as I’d thought. I want to get them in place before my debate with Willie and JT tomorrow, along with several new posts. If all else fails and the wily pair drown me out, I intend to at least direct listeners to a blog full of evidence. 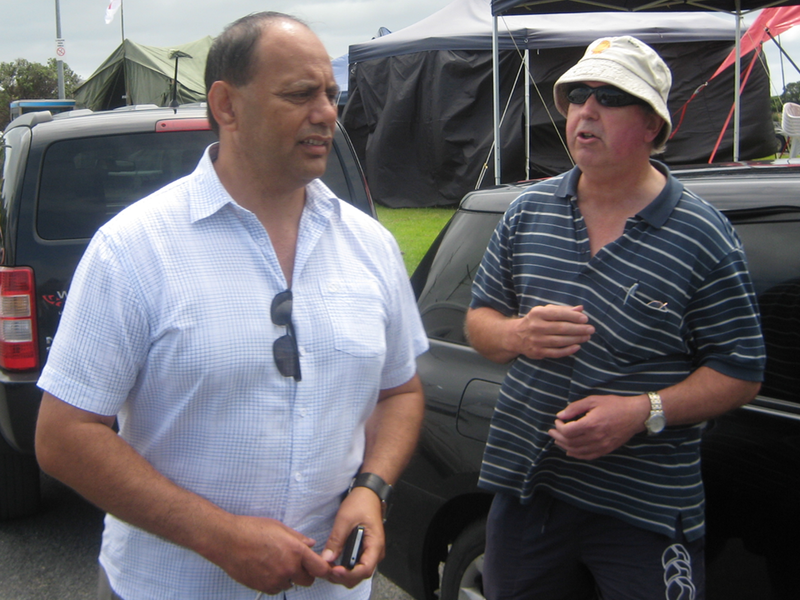 Once on Close Up in 2011 — after calling me a racist who told lies — Willie Jackson told me I was the kind of straight-shooter he’d like to have on his and John Tamihere’s radio show. I didn’t hear any more about it. 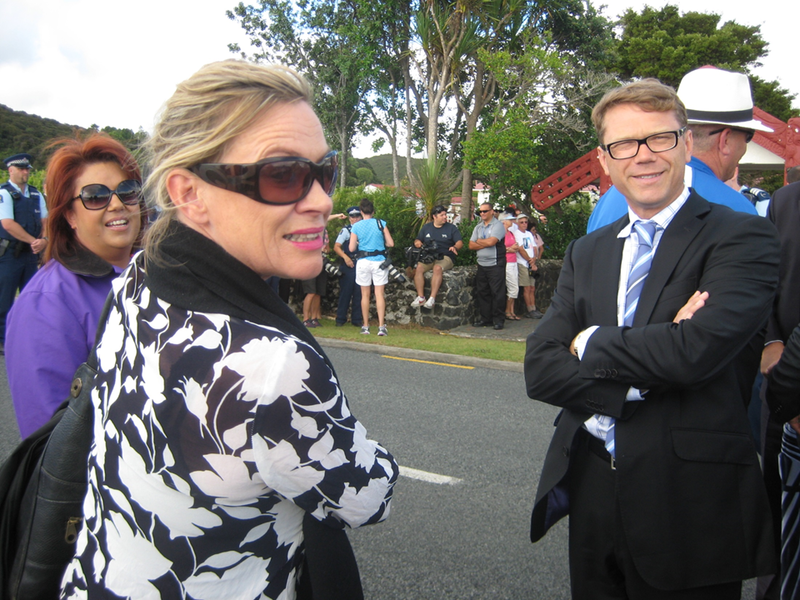 Then last Tuesday, I introduced myself to Willie at Waitangi. He was surprisingly friendly. We had a good-natured chat where we both agreed with each other 100%… that each other was a racist. 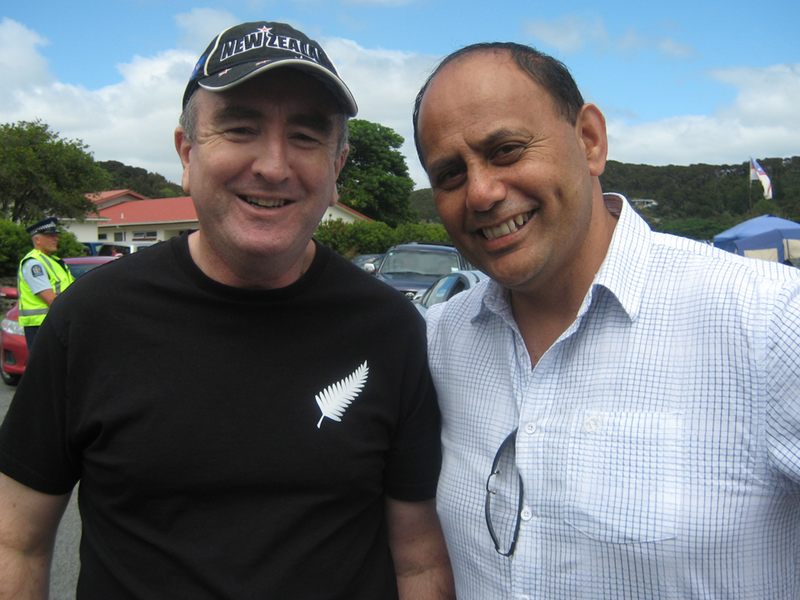 At Waitangi with my new mate Willie Jackson. We agreed with each other 100% that each other was a racist. He again said he’d invite me on his show. 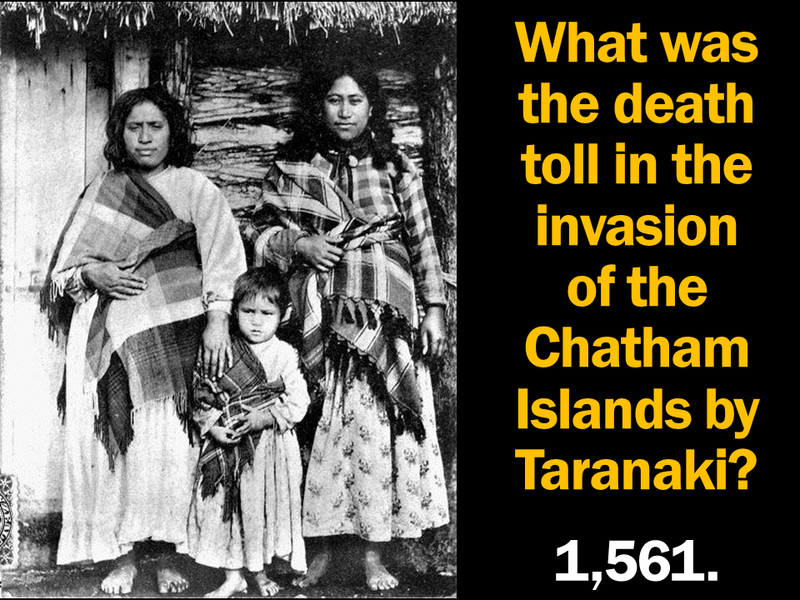 Then the next day, Waitangi Day, I rang the show to correct a flagrantly one-sided account by Tamihere of the execution of captured Maori fighters after the Siege of Ngatapa. Somewhere in the middle of our shouting match, Willie again said they’d invite me to be a guest on the show. So I was a bit disappointed to be told on Wednesday that Willie had said on air that JT and their producer had vetoed the idea. That’s when I started preparing a post with the above pair of timorous yellow tap-dancing chickens, which I was going to label Tamihere and Jackson. Sent: Wednesday, 13 February 2013, 2:42 p.m.
You won’t have John Ansell on because he will tell the truth, and we can’t have that. You say he has a distorted or one-sided view of history? Compared to whose? Yours? 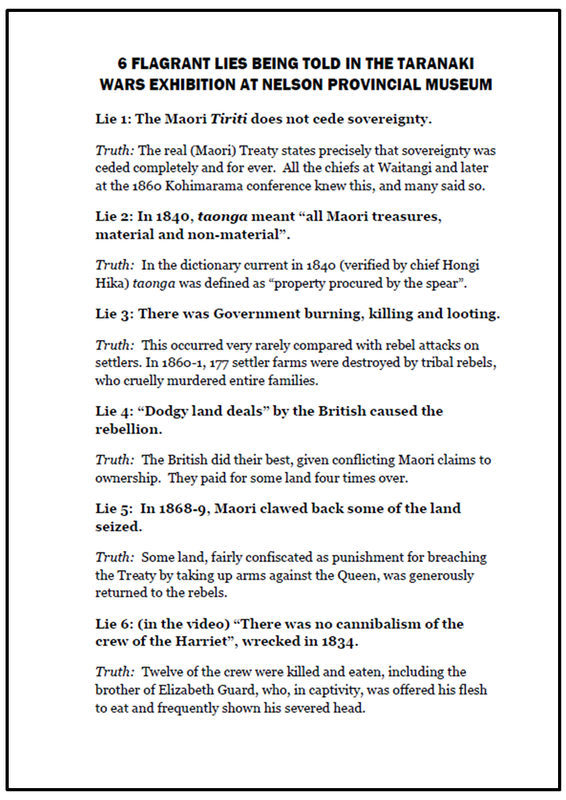 Get real, there is only one history and it doesn’t line up with the Waitangi Tribunal version that pays out on treaty claims. Soon there will be nowhere to hide because the truth will always out. Sent: Wednesday, 13 February 2013, 2:43 p.m. YES AND YOU WILL BE FOUND OUT ALONG WITH YOUR MATE ANSELL. Sent: Wednesday, 13 February 2013, 2:45 p.m. He is happy to line up and challenge you. What are you or your management scared of? The Maoris I know would man up. Sent: Wednesday, 13 February 2013, 2:54 p.m. Sent: Thursday, 14 February 2013, 9:55 a.m.
John Ansell is simply a proponent of one law for all in NZ, as I am. 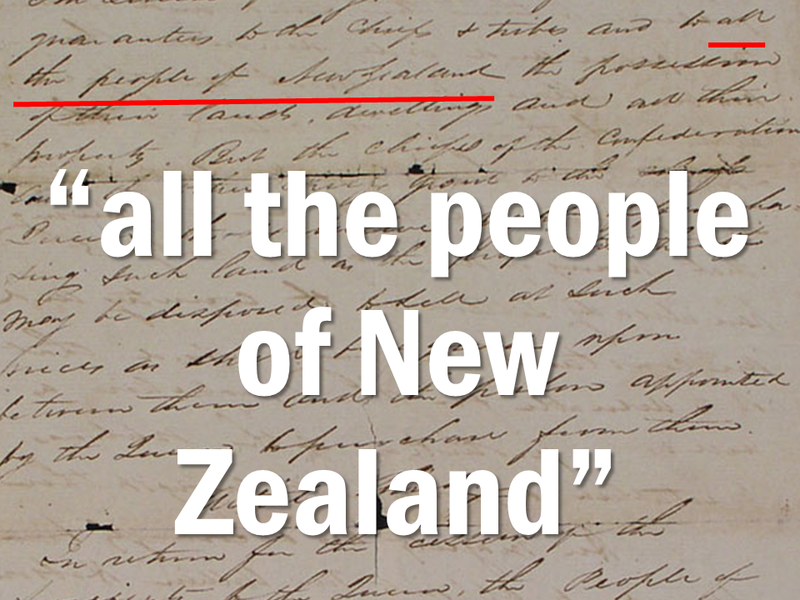 Ansell is simply pointing out that Te Tiriti O Waitangi was created to deliver equality. And no, not everything went smooth for some tribes. But in 99% of cases they certainly asked for land confiscation and consequences. 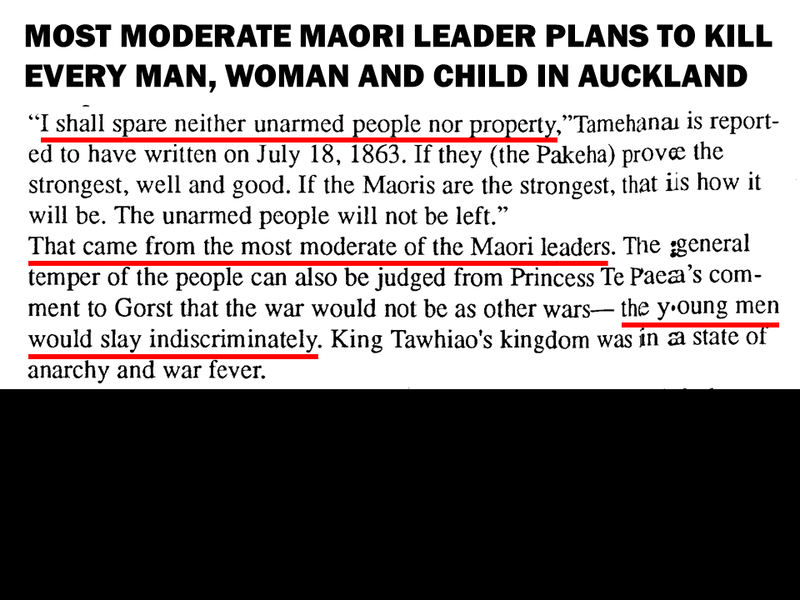 The treaty was to protect the rights of Maori as well as non-Maori, remember? Based on previous polls taken since 1995, I think you are in the 20% (a very generous estimation) of Kiwis who support Maori sovereignty and a continuation of the Waitangi Tribunal scam. 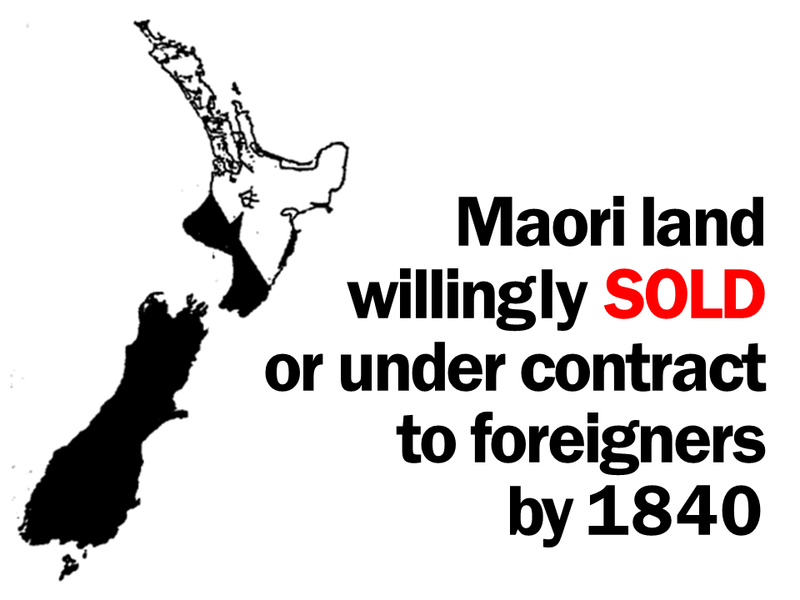 Any dream of sovereignty or a separate set of rights for Maori was ceded forever on 6 February 1840. 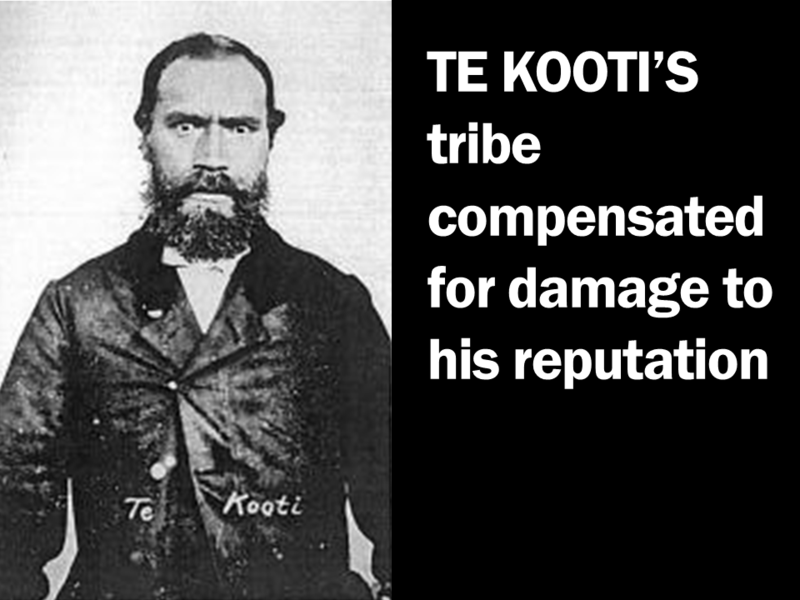 There were 200 chiefs who also ratified that position again at Kohimarama twenty years later. It is only because of gutless politicians, noisy activists and lack of investigative journalism that the ugly creep of separatism has got to where it is in NZ today. 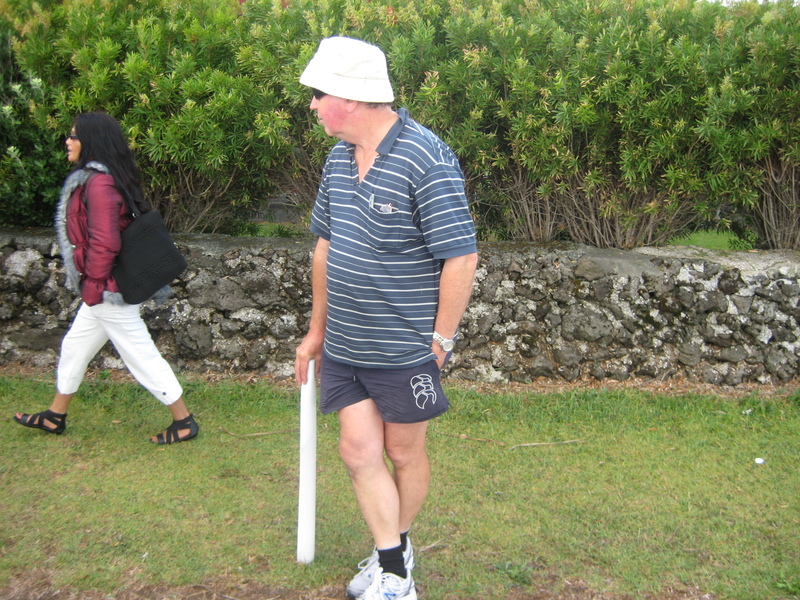 All people such as John Ansell ask is that you, JT and Radio Live management play with a straight bat on behalf of the 80% plus Kiwis who want a united NZ. If Kevin’s efforts hadn’t been successful, my next move would have been to rally the troops for an all-out assault on the phone lines to protest the about-face. At 2.00pm yesterday, Radio Live producer Mary Putnam rang me with the news that Willie and JT now wanted me on their show next Wednesday from 1.00 – 2.00pm. I don’t know if that was the whole story. Tamihere wasn’t on the programme yesterday, so maybe the decision was taken without him. But I was happy to accept, and I’m looking forward to it. Around 100 people came to my talk at the Nelson Suburban Club on Wednesday. It was a good turnout, considering none of the local media picked up on my press release, and the only promotional ads were quite small. I extended my slide show to present photos I’d taken at the Nelson Museum’s Taranaki Wars Exhibition, as well as recent Treatygate protest action. Thus my talk ran to 90 minutes. But no one seemed to mind, and there were some good questions at the end. the Harriet’s crew were ‘sensational’ . would have had to lie to the House of Commons. After running through my Treatygate evidence at length, I proposed my positive solution: a Together New Zealand organisation that would demand a unified, non-racial state and an end to the National-Maori-Labour-Greens policy of state-sponsored separatism. Many people have been urging me to start a single-issue political party. So I asked the audience to be honest with me. I asked them whether, when push came to shove, they really would vote for such a party. Or whether, in the end, they’d still feel too wedded to, say, the National Party’s economic policy, or the Labour Party’s social policies, to sacrifice their normal voting habits for a single issue. I told them I would quite understand if they were not prepared to go that far. But despite my exhortation for absolute honesty, over 90% of the audience raised their hands to say they would vote for a party whose sole policy was to remove the Treaty road block. Now obviously the audience was hardly a cross-section of New Zealand society. But equally obviously we should explore the concept further, since those 100 people probably share the views of 80% of New Zealanders on the issue of racial privilege. I will soon be setting up the Together New Zealand Trust. If we get enough support, the next step may well be a Together New Zealand Party. 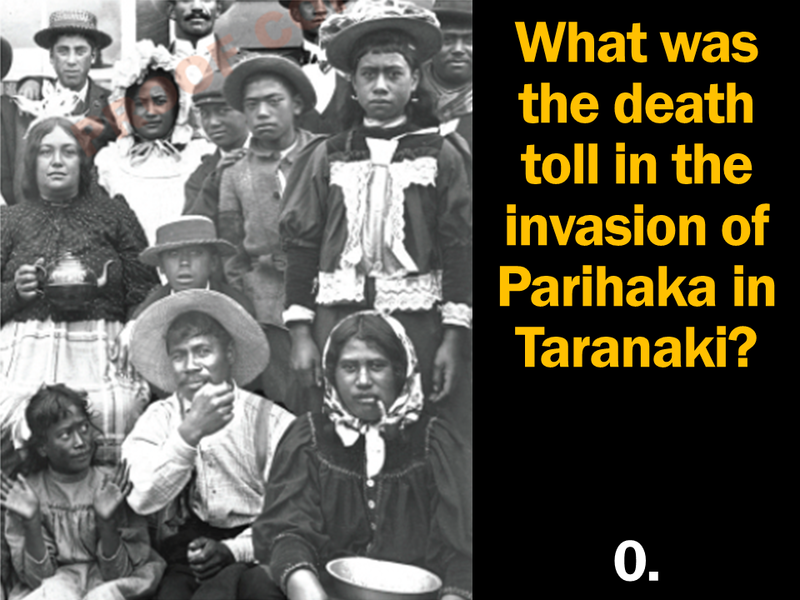 Coming soon: detailed pictorial posts on the latest Te Papa Treaty Debate, Waitangi, and the Nelson slide show. The local paper here in Nelson has advertised my meeting for “7.pm” rather than 7.30pm. Another snag is that my friend who was supposed to be delivering promotional leaflets for the meeting has been detained in Wellington. So please email all your Nelson friends and encourage them to come tonight — 7.30pm at the Sports Hall, Nelson Suburban Club. On the positive side, Nelson Grey Power are apparently getting behind the meeting, so let’s hope their members provide a show of force. Below is the promo and handout if any of you brave Nelsonians feel like handing them out downtown today. Pages 1 & 2 are the promo. Pages 2 & 3 are the handout about the Nelson museum travesty. There’s a lot more evidence where this came from. Come along tonight and see it. 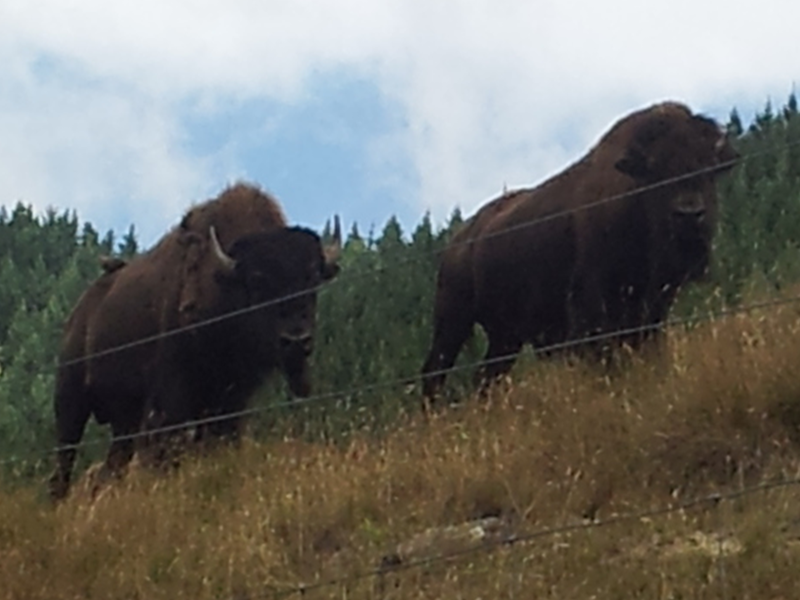 Oh and please leave all bison securely tethered outside. I’m writing this post at the “ranch” of American Kiwi Larry Wood in a beautiful valley just out of Nelson. Believe it or not, I’m gazing at a hillside studded with bison. Apparently Teddy Roosevelt gifted a herd to New Zealand in the early 20th century, and guys like Larry have made sure they remain a going concern. Like me, Larry is allergic to politically correct BS and has volunteered to introduce me at tomorrow evening’s meeting. ‘Treatygate’ campaigner John Ansell says the Taranaki Wars Exhibition which has been running at the Nelson Provincial Museum since September, is a disgracefully one-sided, politically correct fantasy. Ansell, who will be speaking at the Nelson Suburban Club at 7.30 tomorrow night [tonight], says many attempts have been made to alert the exhibition curators to a litany of errors, but they remain impervious to proven facts, and shamefully refuse to correct their mistakes. Nelson Suburban Club, tomorrow’s venue. 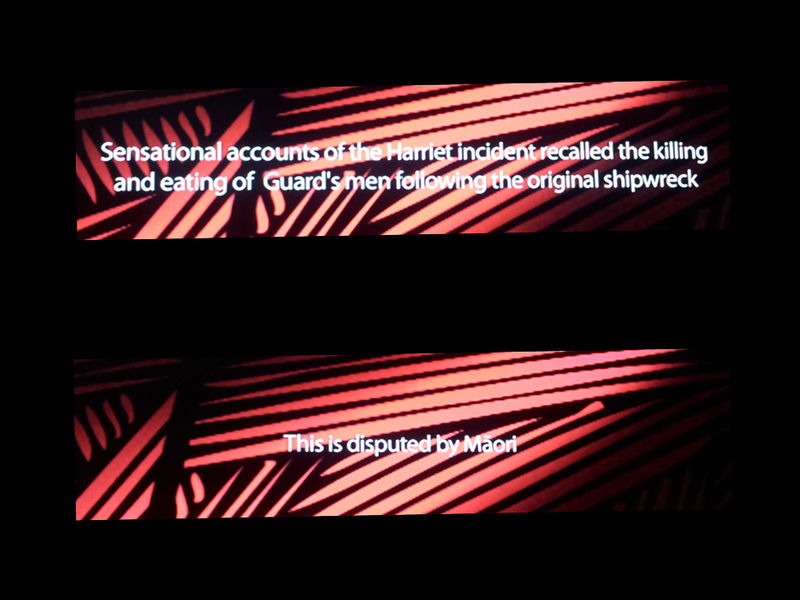 Ansell says dogged Nelson researcher Bruce Moon has repeatedly given the curators evidence of many historical inaccuracies in the exhibition, none more appalling than the claim that there was no cannibalism of the crew of the ship Harriet, wrecked off the Taranaki coast in 1834. 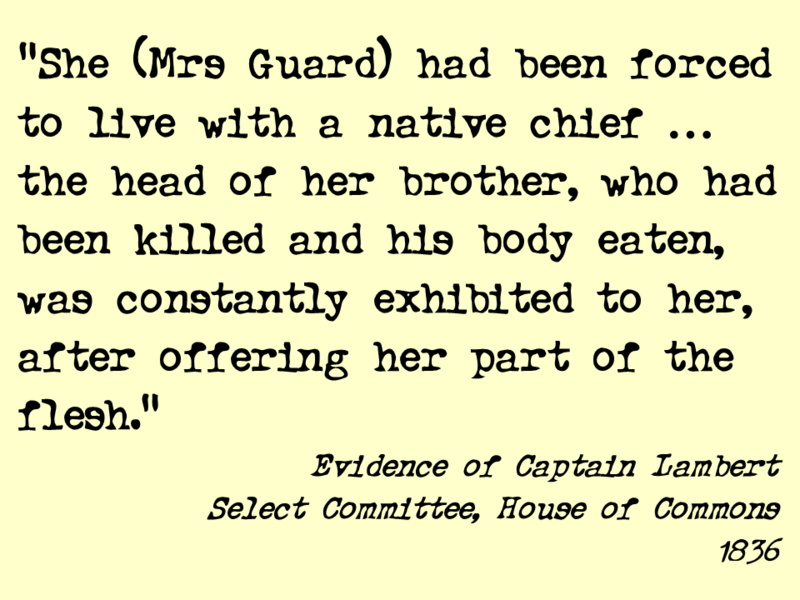 In fact, says Ansell, documents from the time record that twelve of the crew were killed and eaten, including the brother of captured settler Elizabeth Guard, who was given his flesh to eat, and whose severed head was repeatedly paraded in front of her. 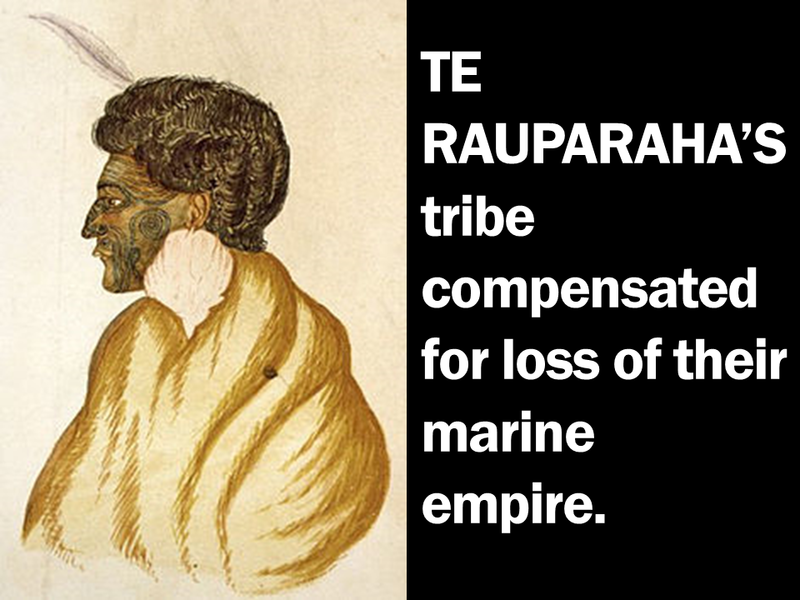 The exhibition also wrongly claims that the 1840 meaning of the word ‘taonga’ was “all Maori treasures, material and non-material”, when in fact this is the modern meaning and the dictionary definition of ‘taonga’ current at the time of the Treaty was “property procured by the spear”. 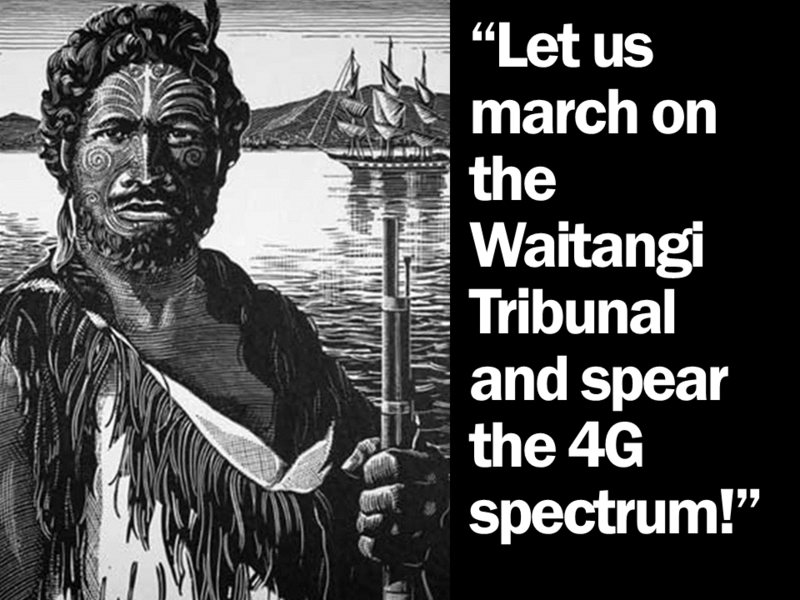 “Even the most one-eyed latter day historian would have difficulty claiming that you could procure a radio frequency with a spear,” says Ansell, referring to the latest iwi leaders’ claim that Maori should receive a share of the 4G spectrum because it is a taonga. 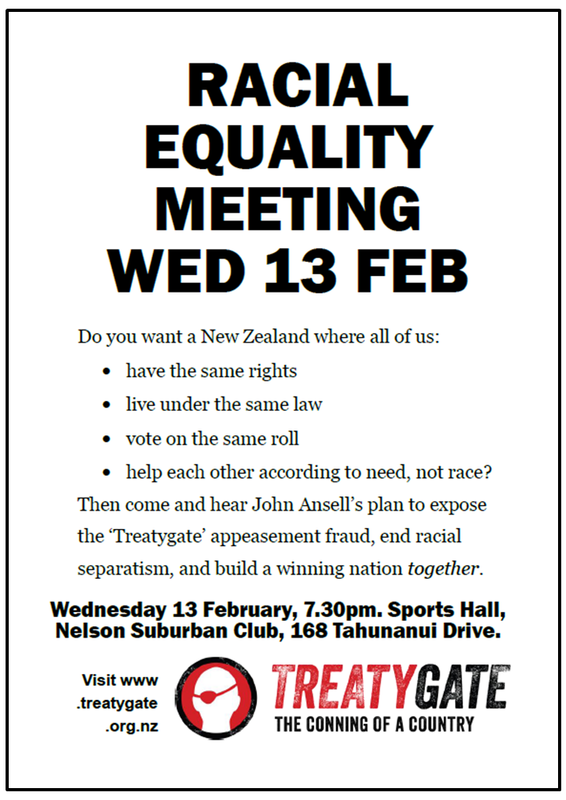 Ansell will present evidence of a forty year, state-sponsored campaign of indoctrination of New Zealanders with an entirely false history of the Treaty, and will call for support for a New Zealand where all citizens have the same rights, live under the same law, vote on the one roll, and provide help to the needy based on need, not race. If you’re in the top of the South, I hope to see you tomorrow night in the Sports Hall of the Nelson Suburban Club at 7.30pm. 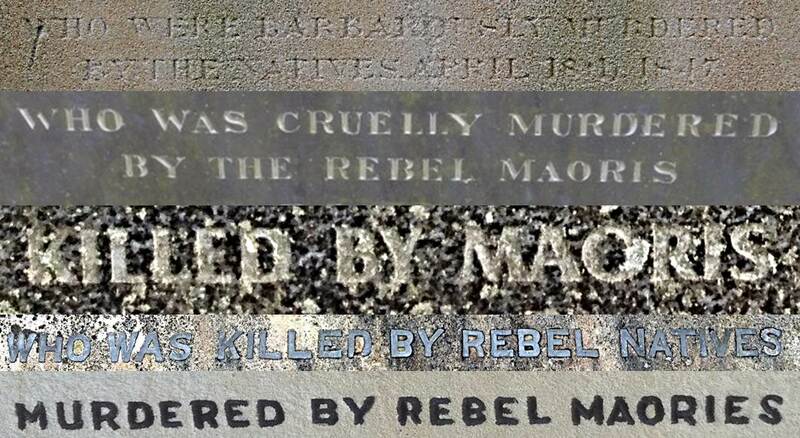 Part of my talk will be in support of the indefatigable Bruce Moon’s dogged harrying of the Nelson and New Plymouth Museums over the pack of lies masquerading as the Taranaki Wars Exhibition. I hope to visit the Nelson Provincial Museum to see the nonsense for myself. Meanwhile, I suggest you revisit my post on Bruce’s work, which I’ve just updated to include the latest salvoes. No one reading the exchange of letters between Bruce and the museums could fail to be struck by the contrast between Bruce’s detailed historical analysis and the bogus historians’ disdain for same. Faced with any fact which threatens to expose their politically correct fable, all the curators and their council apologists can do is get huffy. In an exchange packed with evidence from Bruce, the so-called professional historians could not refute a single one of his facts. My admiration for Bruce is enhanced by the knowledge that he is over 80 and was seriously injured in the Christchurch earthquake. Thank you Bruce for your relentless pursuit of truth. I look forward to meeting you for the first time tomorrow after many months of emailing. What does it say about a Race Relations Commissioner when his own poll shows that race relations are deteriorating by the year? The 2012 Nelson City Council referendum, where 79% voted NO to separate Maori wards. The 2012 Waikato District Council referendum, where 80% voted NO to Maori wards. My latest piece of evidence was commissioned by no ordinary commissioner. It was commissioned by the Human Rights Commissioner’s commissioner for Race Relations, one Joris de Bres. And Joris’s poll shows that he’s managing to achieve less and less every year. Again, we’re looking at a 77% NO vote, with a 3.6% margin of error. NZ Newswire’s Laura McQuillan has alerted me to a rogue Twitterer posing as me from the address ColourblindNZ. The vicious stuff the impersonator is putting out is, I guess, a sign that the Treatygaters believe they have something to fear. Thanks Laura — and thanks also to Matthew Dentith. Yes, you heard right. and it is using some disturbing far right language (“Worldwide White Pride”, references to Klan regalia, et cetera). You might want to notify people on your blog that the account isn’t you. You also might like to think about starting up a Twitter account so this won’t be a problem in future. As to why I’m doing this; I know a fair number of tāngata whenua who are getting upset with the white pride remarks the parody account is making. I may not agree with your views, but I also want a quality debate in the media, not the kind of strawman remarks the parody account is putting out there. I very much appreciate that, Matthew. For the record, I’m no longer using the name Colourblind New Zealand. As others had warned me it would be, I found the name was being wilfully misinterpreted as ‘blind to people of colour’ — which is the last thing I intended. It was, of course, meant to tie in with the concept ‘justice is blind’ (ie unbiased). I notice the bogus site has attracted quite a few followers, so I just hope they now realise that the increasingly outrageous tweets are not coming from me. As I said to Laura, it’s just another battle tactic of the crooked ones. It’s a compliment, as they wouldn’t be wasting their time blackening my name if they didn’t think the Treatygate message was striking a chord. Okiato, the point just around from Russell where Hobson and Busby composed the final English draft at the 8-room home of US Consul James Reddy Clendon on February 4th. Paihia, to which Hobson and Busby were rowed in the afternoon of the 4th, in time for Hobson to deliver his final draft to translator Rev Henry Williams at the Church Missionary Society’s mission station, now a church. Waitangi, to which the Maori Tiriti was taken on the morning of February 5th, along with the final English draft from which it had been translated overnight by Henry and his son Edward Williams, and read to a large crowd of Maori and Europeans in a marquee constructed by Royal Navy sailmakers. After much discussion on the night of the 5th, 40 chiefs decided to sign the Tiriti on the 6th, surprising Hobson and forcing him to come ashore in his suit — and not the full naval regalia depicted in paintings. 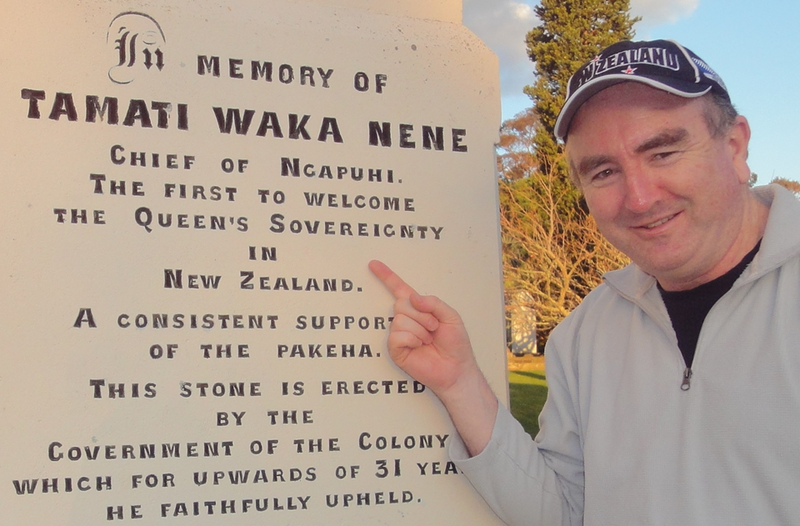 I went to Waitangi to challenge John Key to run New Zealand as a democracy. 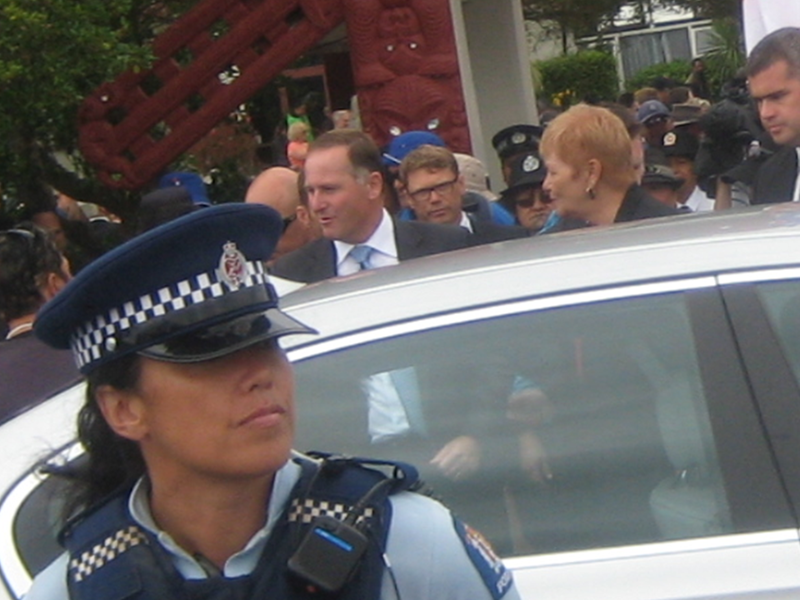 I did so in person as the PM entered Te Tii Marae, and again on the Treaty House lawn by way of this video, now up on our Treatygate You Tube channel. My professional cameraman had to pull out for work reasons, so Mike Butler stepped into the breach at the last minute. Unfortunately neither of us realised how much of a factor the wind was going to be — hence the two options for you here. Above is a re-recorded audio track over a still shot from the video. Below is the windblown original. Thanks to Mike and Mr News, Vinny Eastwood of Guerilla Media. Over the weekend, Vinny and I will flesh out the video with cutaways to supporting evidence. Then I hope you’ll send the link to as many people as possible. Tell them the pushback has started! Thanks to Mr News, Vinny Eastwood of Guerilla Media, for making You Tubes of my two radio appearances yesterday — and one of listener comments below. Radio Live listeners should now be aware that the pushback has started. Willie and JT are clearly not used to being confronted with facts. JT at least had the good grace to concede later that some of my facts were correct, and Willie told me I wasn’t a bad bloke after I introduced myself to him at Waitangi. Good to know we can hold diametrically opposed views but still maintain respect. I thought callers Kevin, Jean and David supported me exceptionally well, against the usual fare of put-downs and hang-ups by the infamous one-eyed tag team. I was especially disappointed in the irrational behaviour of guest Dover Samuels in telling caller David that he must be from another planet if he thought New Zealanders should be equal. Both Jean and David have since contacted me, and it turns out both had plucked up the courage to phone talkback for the first time yesterday. Good on them for going head to head with the bully boys and winning hands down! I am still in Auckland working with the generous Vinny Eastwood to making You Tubes of my recent TV and radio appearances, and two videos Mike Butler and I shot at Waitangi. 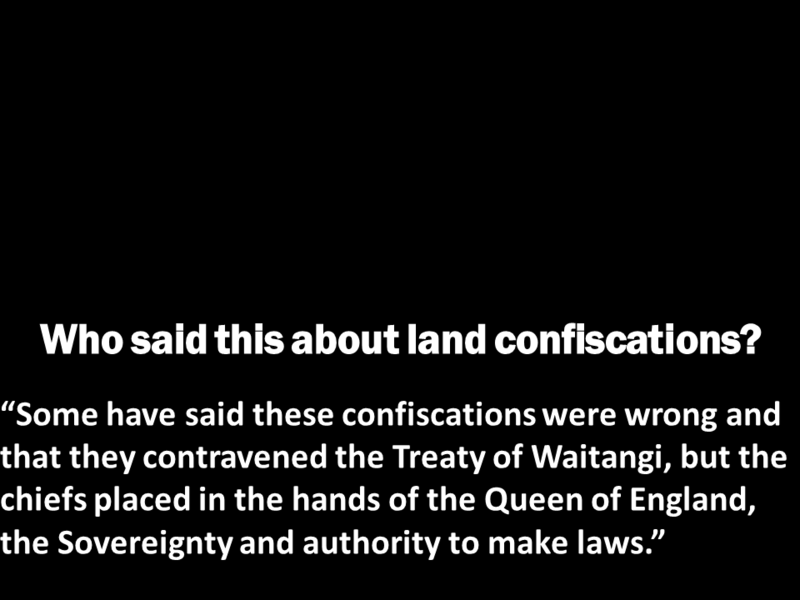 This has delayed my main Waitangi post, which I hope to get on to in the morning. Next stop Martinborough for some R&R, then Nelson next week.